Description: Drawing on research from the field of narrative ethics, The Storied Ethics of the Thanksgiving Psalms argues that story and storytelling function as important instruments in a given community's ethical shaping. While this argument has gained some traction in the field of Old Testament ethics, it has yet to inform an ethical reading of non-narrative texts, such as the Psalter. However, because the thanksgiving psalms are characterized by their inclusion of the worshipper's story, they stand to benefit from the application of a narrative ethical approach. In the present study, this argument is tested through a close reading of three thanksgivings � Psalms 116, 118, and 138 � each of which clearly demonstrates a didactic concern. Yahweh is presented as one who is worthy of trust, even in the midst of personal disaster. The affirmation of Yahweh's character provides the framework for the community's continued (or renewed) commitment and trust, hope and expectancy. The example provided by the worshipper challenges the audience to pray as they prayed, to trust as they trust, to live with hope as they live with hope. In addition, these psalms, and the stories they retell, invite the audience to tell their story when God answers their prayers, and to do so in public, in corporate worship, for the benefit of the community. These intended results � prayer, commitment, trust, hope, expectancy, public storytelling and thanksgiving � are not typically pursued in �ethical� studies, but they are clearly part of the Psalter's comprehensive vision of the ethical life and are, therefore, worthy of careful consideration. 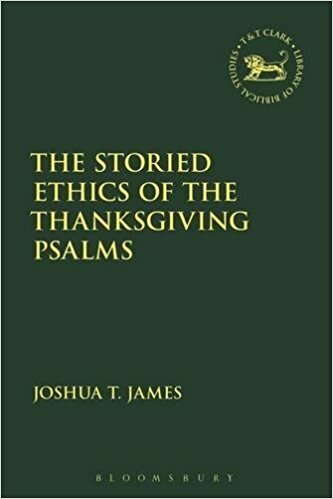 Review by J. Clinton McCann Jr.
Citation: J. Clinton McCann Jr., review of Joshua T. James, The Storied Ethics of the Thanksgiving Psalms, Review of Biblical Literature [http://www.bookreviews.org] (2019).